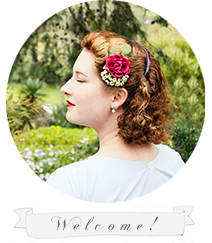 This week I really wanted to make up Brittany’s 1940’s Fashion Calender challenge for January: a fabulous Flower Brooch DIY. Try as I might, however, I couldn’t find the craft supplies I knew I had lying around. The fabric flowers I wanted eluded me in spite of three days of searching my shed and going through boxes of stuff several times over! So in true “Make Do and Mend” fashion, I decided to do what I could with what I had on hand ~ felt. Inspired by some lovely felt flower brooches on the internet I came up with this royal blue three piece corsage. It took quite a while to make, but that’s because I was busy creating a tutorial at the same time, so look for that coming up on the blog soon! In the mean time, I am really pleased with how it all came out. When I was making it up, I was a bit worried that the dimensions of the brooch would be to big to wear on a dress ~ sort of more of a coat sized brooch if you know what I mean? After I pinned it to my dress though, I decided I really liked the larger size! It means that the flowers show up nicely. So many of my brooches are gorgeous, but get a bit lost on my clothes ~ particularly if I’m wearing a print fabric. I LOVE this! I pondered felt as well, since it's what I have, and I may have to do it now! Yours looks fantastic! Ugggghhh I want your whole outfit - how do you look so adorableeee!! I think you're totally right, if the corsage was smaller, would get lost. I noticed how in the old times women wore larger brooches/corsages than now. In the beginning I thought I would look silly with them, but makes sense to be bigger. And here is the proof! You look gorgeous with yours! Thank you Beta, I do hope you enjoy the tutorial. I must say, I didn't notice the 'larger' brooch thing myself, but you are right ~ it does make perfect sense. The size of the brooch definitely works in its favour - you cannot ignore it! It's absolutely adorable and deserves all the attention it gets. I just love the stamens inside each flower. That brooch is gorgeous! I am SO glad you are going to do a tutorial on it! And your dress is positively cool and lovely looking. I think you did an amazing job "making do and mending"! Your brooch turned out wonderfully, and I think you're right that the larger size works well for a printed dress. I love to wear a busier print, and but sometimes I'll look at photos and realize that I needn't have bothered accessorizing, because you can't see any of it. Also, beautiful pregnant women make me a swoony. You're growing life! Inside your body! Way to perpetuate the human race for us (probable) non-breeders. Mmm, I also love prints but find that problem! You have these gorgeous little accessories that add so much, but just get lost and it's like... Awww. Still, I'm glad I found out that I like larger sized brooches, because I think I'm going to make an effort to add some more to my ever-increasing collection! Big, small, medium, gigantic, itty-bitty, I love them all! Brooches are my number one vintage jewelry go to as well. Though this does stem somewhat from the fact that I'm allergic to nickel and thus have to avoid a lot of costume jewelry if contains metal (unless I'm certain said metal is nickel-free), I suspect that I would love and wear them nearly as much (if not the same amount point) blank even if that wasn't a factor. I really started ramping up my brooch collection about three years and have grown it quite a bit since then - it now total over 100 brooches, many are vintage and some just look the part, but I love them all equally and really enjoy partnering my pin with my daily outfits. Speaking of outfits, this one is so tremendously pretty and your big bouquet brooch is the perfect choice for a sweet, feminine dress like this. It's just gorgeous! I love the flowers that you made yourself, and that makes it so much more interesting and lovely. I'm just starting to see the value of brooches again. I had a bit of a collection as a child, and then later I just didn't get what the point of them was, but now I'm coming around again! I think your brooch is totally adorable! Felt is a great material to get creative, and making brooches allows you to match the colours of a dress. Before I became a vintage sewer, I have never worn brooches, but now I have a huge (and constantly growing) collection. I even make my own from vintage supplies. I'm happy I found your blog, I will certainly come back often! All the best for you and your baby, take care! Isn't it funny how brooches just seem to become one of those indispensable vintage accessories? I adore them, and though I haven't made many of my own yet, I certainly want to keep trying my hand at it! I really like polymer clay for crafting brooches out of, though I have some beautiful ones in my collection that are felt. I will be so happy to see you around, and the visiting shall be mutual. I'd love to see some of the brooches you have created, I find that sort of thing so inspiring. :) b.
hello,ciao Bonita...first time here and enjoy the visit,You have a such great,enjoyable Blo...and...Your Style is fabolous...so creative,so ...artistic...and the photos are so nice...cheers! It seems like everyone has done a bit of Make Do and Mend on their brooches. I love how yours came out using felt.